The first person to promise women freedom and power through smoking was Edward L. Bernays in 1929. He thereby single-handedly initiated social acceptance for women's smoking; and probably the lung cancer epidemic that struck women in the final quarter of the 20th century. It turns out that he did so at the behest of the American Tobacco Company. 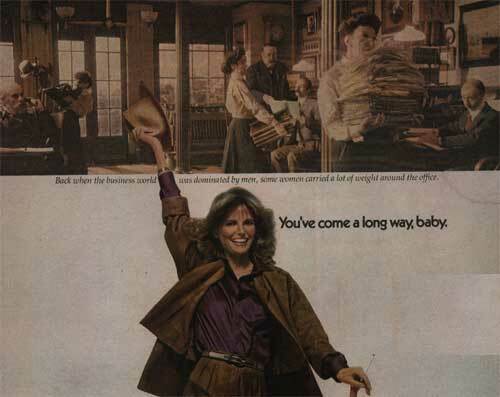 The health effects of smoking on women, and advertising's role in getting them to start has drawn the attention of the U.S. Surgeon General. Parts One and Two of the BBC documentary series the Century of the Self tell the story of Bernays and his role in the development of 20th century propaganda in the United States. Reviews of the series can be found at http://www.tagg.org/rants/selfcent.html. Links to all four hours of video are here. 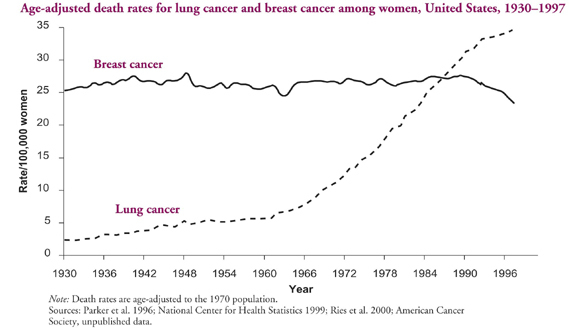 David Satcher's 2001 Surgeon General's Report on Women and Smoking included the following graph. It illustrates just how far women have come.